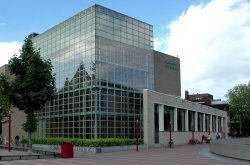 The Van Gogh Museum in Amsterdam is home of a fabulous collection of paintings by Vincent van Gogh - one of the most important artists of the 19th century - and his contemporaries. The Van Gogh Museum in Amsterdam is competing with the Rijksmuseum as the most important museum of Amsterdam (and indeed, of the Netherlands as whole). By the way, they are located right next to each other at the Museum Square (Museumplein) - very handy. While the Amsterdam Rijksmuseum is often seen as more 'important' (since it focuses on art from the Golden Age, during which Dutch art and society blossomed), the Van Gogh Museum is the country's best visited museum: around 1.5 million visitors annually. As the son of a reverend, the young Van Gogh worked in an art trade business, was a teacher and studied theology. All these occupations lasted only shortly, as he gave in to his calling as an artist. He largely taught himself how to paint. Unsuccessful at making a living for himself, he barely survived on donations from his brother. 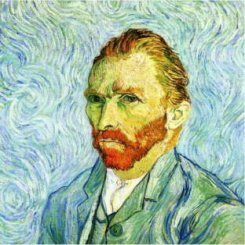 Van Gogh had a difficult personality: he got into arguments with just about everybody he encountered and regularly experienced depressions and nervous breakdowns. During an argument with a friend, famous painter Gauguin, Van Gogh cut off his own ear. After staying in mental hospitals on and off, he committed suicide by shooting himself in his breast at age 38. Van Gogh made his large number of works (860 paintings and almost 1200 drawings etc.) in only 10 years time, working like a madman. His recognition only came after his death. Van Gogh himself managed to sell only one painting during his lifetime (to a friend's sister). The Van Gogh Museum in Amsterdam owns no less than 260 paintings by Van Gogh. They were largely donated by Vincent's younger brother, Theo van Gogh. Many works by Van Gogh are portraits and landscapes. During his early period, he was influenced by expressionism. A famous painting from this time is the gloomy 'Potato Eaters' (1885). Van Gogh wanted to be a 'peasant painter', portraying his subjects with profound empathy, but without sentimentality. He wrote in a letter that the hands that took the potatoes, had dug the earth previously, and their meal was earned honestly. 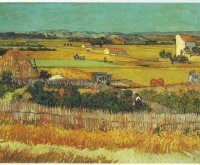 Later, he would lean over to post-impressionism, He used bright colors, especially yellow, and put paint in thick, rough strokes on the canvas, often using a spatula. Famous paintings in this style are 'The Harvest' (1888) and 'Wheatfield with Crows' (1890). During the final time of his life, as he went insane, he used more and more 'pointism', meaning he only used dots in the primary colors of red, blue and yellow. Carefully placing small dots created colors and movements in the eye of the watcher. Besides works by Van Gogh, the museum has a rich collection of works by other 19th century painters belonging to impressionism, post-impressionism or other movements. Many of them influenced Van Gogh or who were influenced by him. Some key names are Paul Gauguin, Jozef Israëls, Claude Monet and Maurice Denis. The Van Gogh Museum of Amsterdam is located at Paulus Potterstraat 7, right next to the Rijksmuseum. This makes it easy to visit several museums in one day. However, as waiting lines can be long (especially in the summer and during weekends), it's best to show up early or buy a ticket online to skip the lines. For ticket prices, opening hours and special exhibitions, visit www.vangoghmuseum.nl. If you have an Iamsterdam Card, entry is free of charge unless there's a special exhibition. 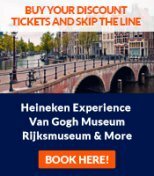 The I Amsterdam Card also gives free access to e.g. public transportation for a specific time slot and is recommended. Directions with public transportation: take tram 2, 3, 5 or 12 (stop Van Baerlestraat) or tram 16 or 24 (stop Museumplein). Accessibility by car is not terrific, like elsewhere in the Amsterdam city center, but if you must, the best parking option is the Q-Park garage under the Museumplein (the square between the 3 museums mentioned). The museum has a gift shop and a cafeteria with a nice view over the Museum Square (Museumplein), serving snacks and simple lunch options.